The major financial markets declined 6% on the last week – the biggest drop since 2016. There are several reasons to blame: Trump putting tariffs on China, Facebook dropping and dragging tech stocks, Wednesday’s Federal Reserve decision or Trump’s lawyer resignation. While all of them look attractive to blame, none of them pose a systematic risk to the market at the moment. Thus, today’s market review still suggests a bullish view for the US stock market. Trump team is planning to levy a tariff on $60 billion U.S. imports from China. As a counter attack, the Chinese government announced tariffs on up to $3 billion of imports from the U.S. This combined tariff affair represents less than 1% of total global trade, which is a very insignificant number that could generally jeopardize world economies. Facebook dropped after the scandal with Cambridge Analytica. It is not the only reason, why Facebook is troubled. Its entire advertising scheme has gaps. Anyone can advertise more-less whatever they want without disclosing appropriate profile of contact information. It had also recorded a decreased time that users spend on a platform, which is a negative element for future growth. Generally, the earnings growth prospect is not that fancy anymore. However, these are all intercompany issues that do not endanger other TECH companies’ balance sheets. The technology sector is still on – still best-performing sector. History does not repeat – History rhymes! An increased volatility moves the stocks up and down in this correction. We need to get used to it, the historically lowest volatility is over for some time at least. The US indexes landed again on their long-term support levels and market participants are wondering what’s next?! A famous American writer said, “History doesn’t repeat itself, it rhymes.” This quote applies very well to the stock market. You must never expect a same reaction to the market events when applying trend analyses, however, you can expect the similar behavior of the stock market. Corporate earnings are strong and expected to be even stronger this year and thus, there’s no doubt about still bullish view also in today’s market review. Below is an S&P 500 three yearlong chart, where we can see the last correction the beginning of 2016. Same season and same pattern rhymes with current correction. The bullish reversal pattern – double bottom – happened also few months before at the end of summer 2015. Let’s see how this one is going to revolve. 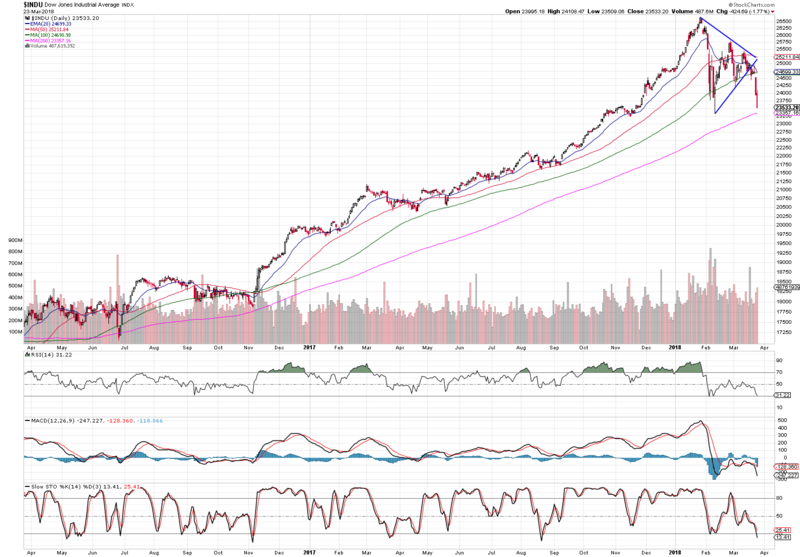 S&P was nicely breaking every support level as depicted by trend lines and moving averages until it landed on 200 SMA. Dow broke down from its triangle pattern landing almost on the 200 SMA. 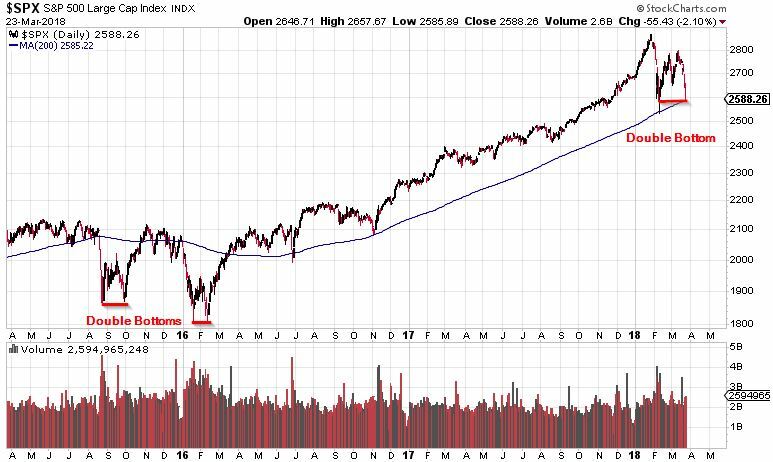 A top performing index broke its 100 SMA last week. It has also disrupted the long-established trend channels. 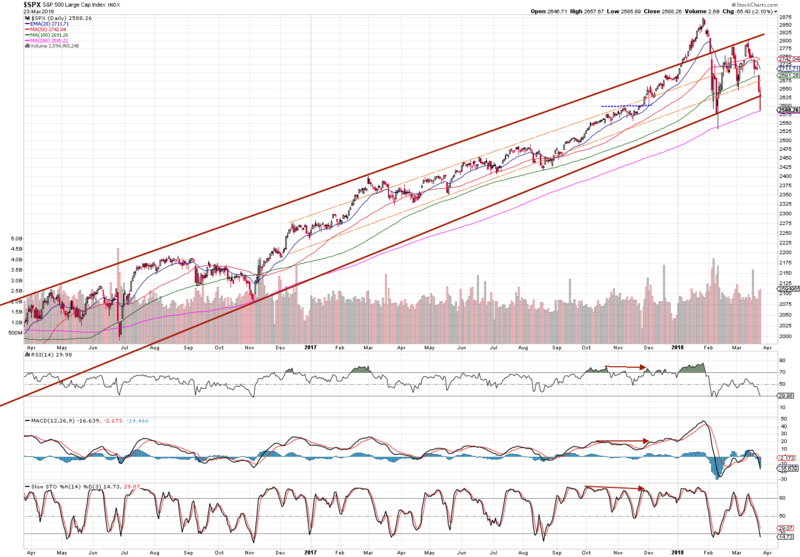 Nasdaq seems to be forming a completely new trend. Current correction makes it impossible to find a new trend yet. We are going to need a few more weeks. The UK market keeps going down. Let’s see where it stops. At the moment it behaves very untrendy. The current market review suggests an increased volatility, investors’ fear has risen due to negative news and major indexes are still consolidating. 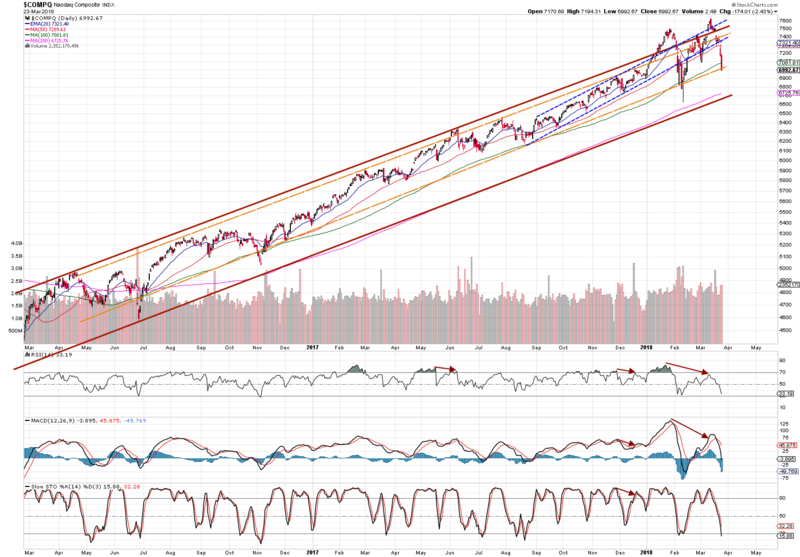 However, the fundamentals are still strong and thus, this correction seems to be of healthy nature bringing more buying opportunity. Let’s stay disciplined and focused on big trend!